Despite no amenities, Pillsbury State Park may have been one of my most favorite. 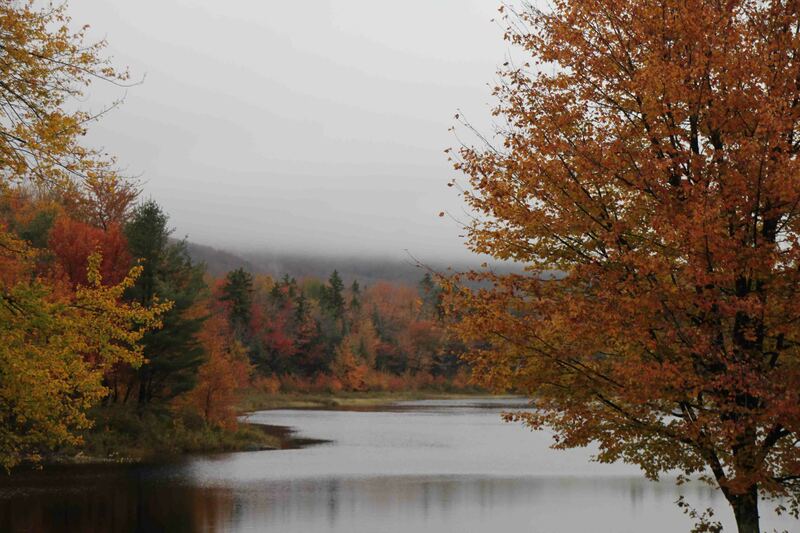 Trees covered in fall foliage surrounded three different tranquil ponds while a babbling brook passed my campsite. 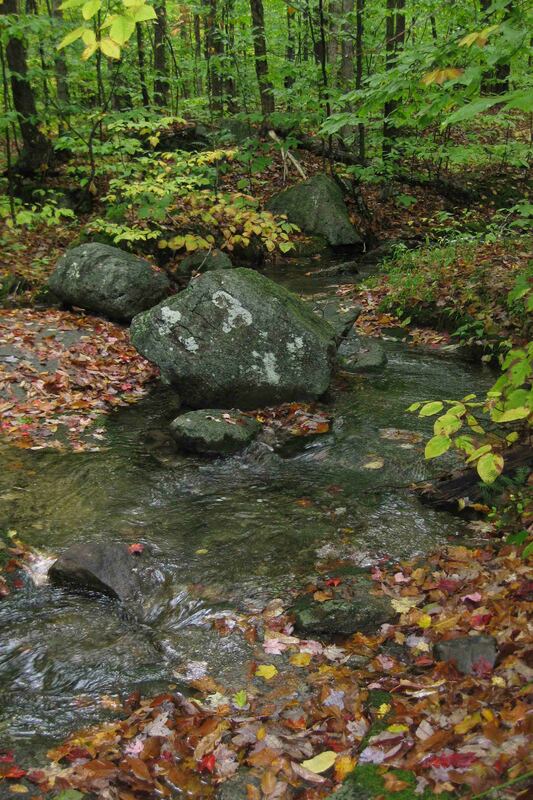 I awoke to intermittent rain, or so I thought, on occasion I think I mistook the peaceful sounds of water flowing in the brook as rain. I had a busy itinerary planned for the day, so it probably wasn’t the best time to sleep in, but I was kind of tired of being soaked to the bone and needed to catch up on some zzz’s from the very beginning of my journey. Scout, Petey, and I did take a 30 minute hike just to soak in the magnificent color and the relaxing views of the ponds as well as a nearby waterfall. I definitely could have spent another day here walking the trails. Tracy, the ranger, was very nice and a proud mother of a 7 week old baby boy named Tucker. Amazingly, she came back to work at the park on 6 days after having a C-section…not much maternity leave for her…at least she could have Tucker with her! On my way to my first stop, Quechee Gorge, I took a slight detour to Hanover to get a quick glimpse of Dartmouth. While the campus encompasses countless red brick buildings, for some reason, I expected it to have more presence than it did…sorry to any Dartmouth graduates out there. 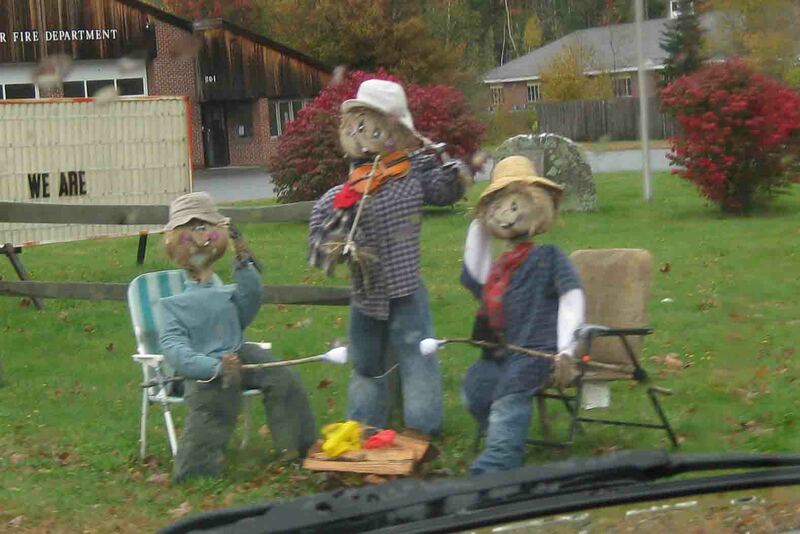 Just as Killington, VT displayed hay bale sculptures, this area of Vermont displayed scarecrows. I’m already looking forward to Halloween. Having been to Quechee Gorge previously, my stop here was like a park-n-grab cache…Stop, look, and photograph. 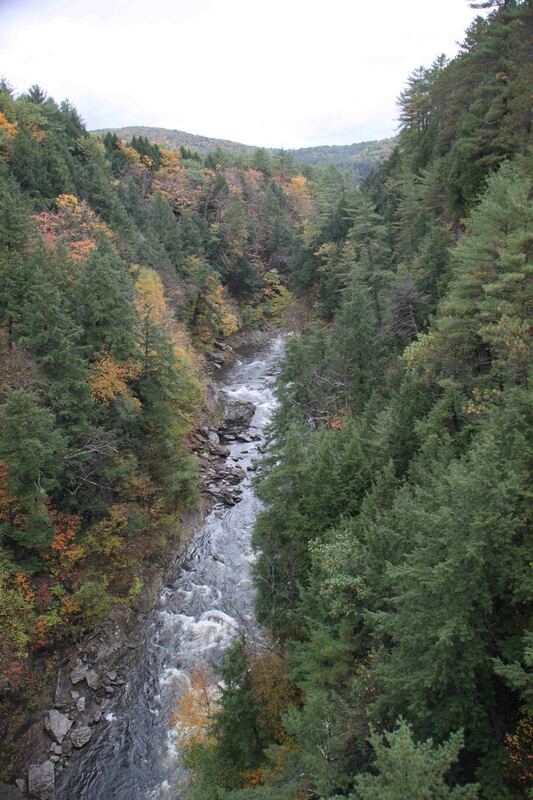 The bridge from which the picture is taken is 165 feet above the chasm created by Ottauquechee River. The area offers other hiking, but is extremely commercialized, so I kept going as I prefer “off the beaten path” type places. My next stop on Highway 14 was the boyhood home of Joseph Smith born in 1805 and founder of the Church of Jesus Christ of Latter-day Saints. It is here where I met Sister “Smith” who provided me with The Book of Mormon. 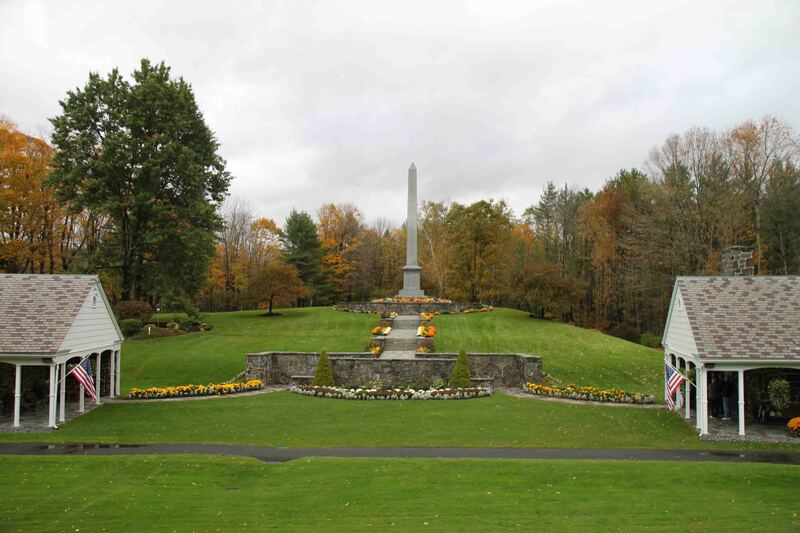 In addition, she also informed me that the granite obelisk, erected in ­1905 as a memorial to Smith, is 38 ½ feet tall, one foot for every year of Joseph Smith’s life. Christian music resonated through the cold air providing a feeling of a worshiping atmosphere. This site is also a virtual cache, so I logged another one! Detouring a few miles off of Highway 14 toward Strafford, led me to the Justin Smith Morrill Homestead. According to the Reader’s Digest book, Morrill, a three-term U.S. congressman and longtime senator, introduced the “1862 Morrill Act which granted states federal lands in order for the establishments of colleges”. 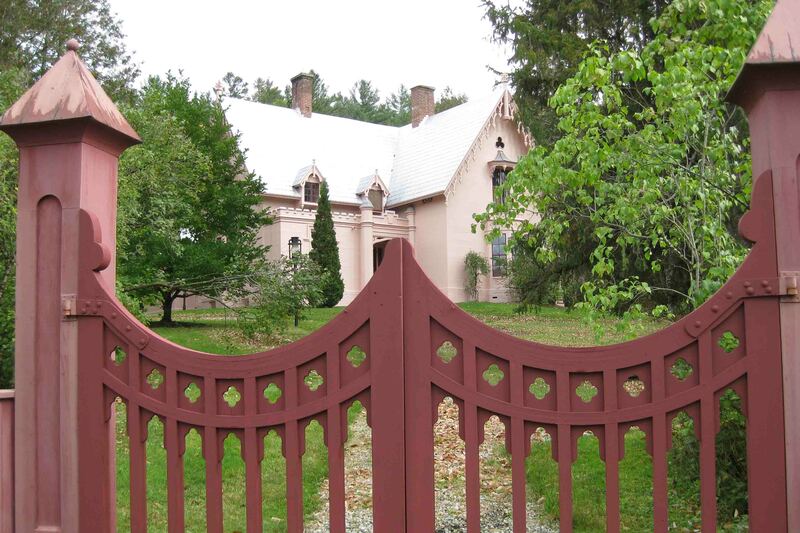 The pink mansion made me wonder if the senator ever worked with Mary Kay…just kidding. Actually, I was concerned I had missed it, but quickly realized that would have been impossible as long as I was on the correct road. 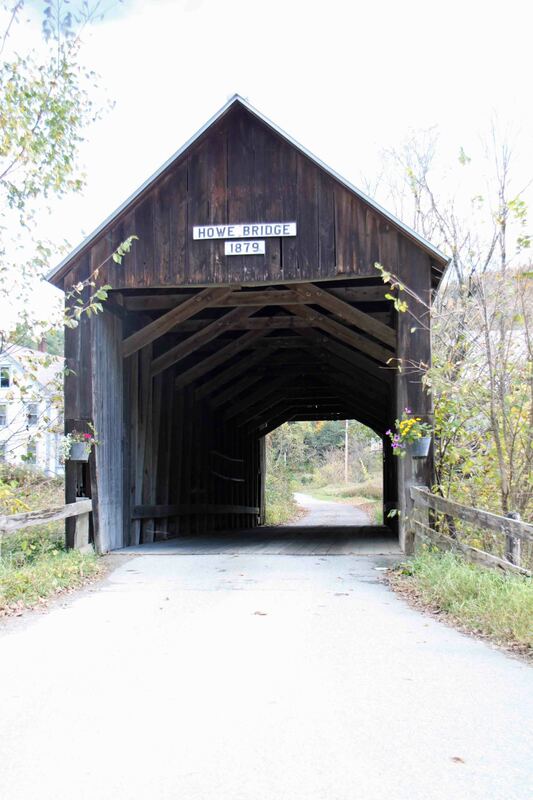 Turnbridge, VT is home to several covered bridges, five per my travel guide, though I only saw two. I guess I’m not very observant. Howe Bridge, on the south of town, dates back to 1879 and is almost as old as Tunbridge’s self-proclaimed World’s Fair, a festival that has been held every fall since 1860. For a small town, the fair grounds were quite large. I got the impression the festival is quite an attraction for New Englanders, but I could be wrong. White churches seem to line the roadside like cattle grazing on ranchlands in Texas. I hope I never get directions from a local saying turn at the white church…the one on the hill, the one by the pond, the one with the clock? I couldn’t count how many I passed by before arriving at Sunset Lake in Brookfield. Sunset Lake, while home to an annual Ice Festival every January, is home to a floating bridge year round. 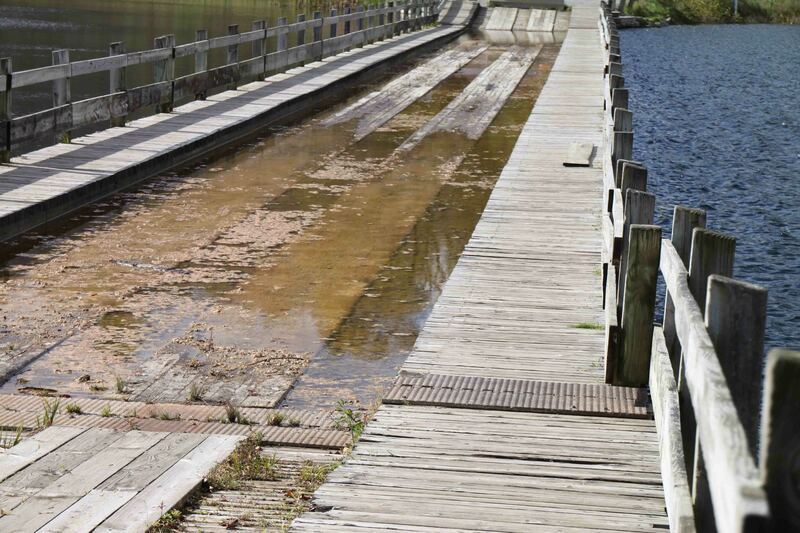 The lake was too deep to build a conventional bridge, thus the first floating bridge was constructed in 1820. The current bridge, the 7th, was assembled in 1978 and is closed to traffic. The dogs and I took a quick walk across as a winter breeze quickly cooled any warmth from the rays of sun that intermittently shone through the clouds. Just outside of Barre, in Graniteville, I visited Rock of Ages, a company that has been mining stones since 1885. It is positioned next to the deepest granite quarry in the world and produces one-third of the nation’s memorial stones. 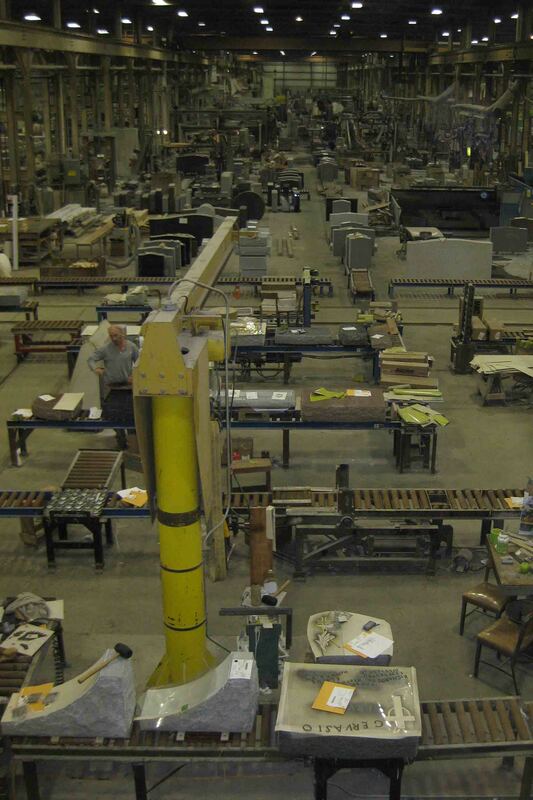 In addition to the factory being on display by a self-guided tour, outside a granite bowling lane was available to anyone who wanted to set the pins up and then bowl to knock them down. Apparently, the company experimented with bowling lanes for commercial use in the 1950s. Finally, for anyone who has seen the last Star Trek, I’m told the guy leaping off the ledge was filmed at the quarry. I could have gone on a tour of the quarry, but it began to rain, and quite frankly, standing in the rain for 40 minutes didn’t sound very appealing to me. The good news, part of the quarry which was no longer used, was just up the road, so I got to see it. 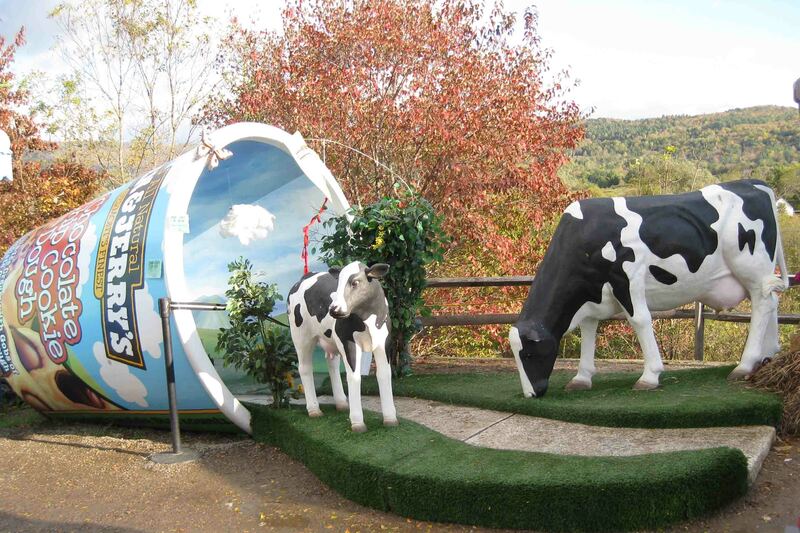 A visit to Vermont would not be complete without a visit to Ben & Jerry’s Headquarters in Waterbury. Ben & Jerry’s original ice cream shop was located in a converted gas station in Burlington, VT. The ice cream was so good, they sold out in 10 days! In two years, the company began shipping ice cream to local stores, and by 1985, they had moved for a third time to the current headquarters. The headquarters offers fresh Ben & Jerry’s and a tour of the factory. The weather briefly improved and the place was packed…a 30 minute wait just to tour the ice cream factory. It was getting late, and not one known for patience, I opted to skip the tour – the scoop of Half-Baked satisfied me. What I found most surprising was Ben & Jerry’s pint size best seller at the supermarkets. Take a guess and tune in tomorrow for an answer…PS – no googling. Before I went to camp at Elmore State Park, I stopped for a good dinner at Foxfire. It was fine Italian dining. I was just craving something green, so I ordered a spinach salad with mandarin oranges, almond slices, and gorgonzola with a hot vinaigrette and mussels in white wine sauce. It was nice to have a good meal! I guess I fell off your list of reply people as I had to reenter my information again. I vote for Chocolate Chip Cookie Dough. So interesting about the granite. That is strange…not sure why that happened. Glad you rejoined! I’m guessing ‘Cherry Garcia’ ……. sounds like a great day filled with good treats ! making me hungry. I’m guessing Cherry Garcia. Hopefully it’s not vanilla or chocolate! Your day sounds marvelous! So many wonderful places to see and such beautiful scenery. Since I’m not one for cold weather it amazes me that I love this part of the country. Wish I were with you! You are right! Surprised it was fruity.